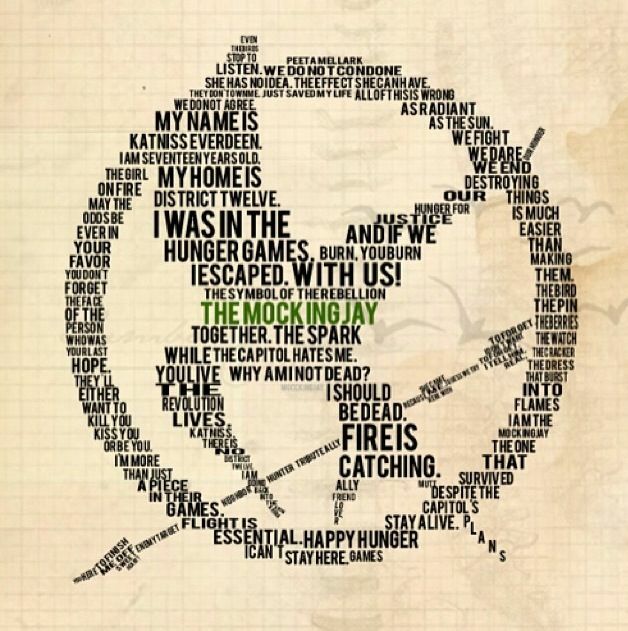 The inspiration for this project came from seeing an image of the mockingjay pin from The Hunger Games created out of words. My students were reading The Hunger Games at the time and I wanted to have them create something similar. I looked at sites like Wordle and Tagxedo, which let you create word clouds, but neither had the flexibility in shapes that I was looking for, so this project ended up being no-tech. Students first selected their favorite character from the novel and brainstormed words to describe and associated with that character. 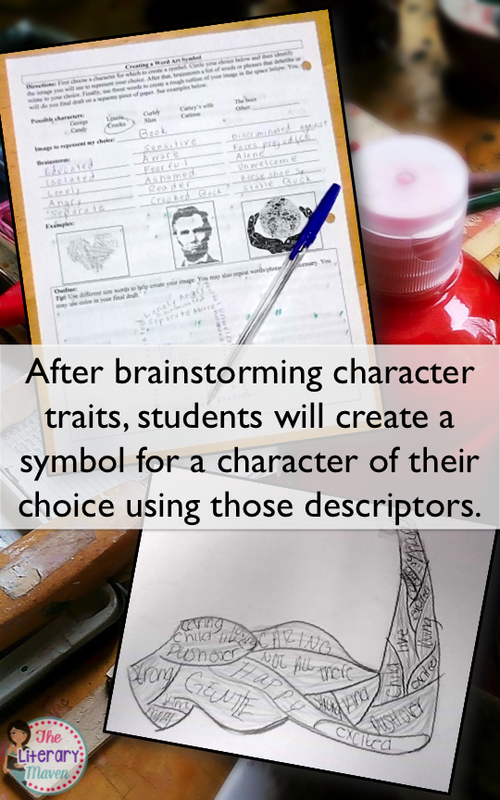 During this brainstorming, you may want to remind students of the different methods of characterization: direct characterization and indirect characterization through appearance, actions, thoughts and feelings, dialogue, and other characters’ comments. 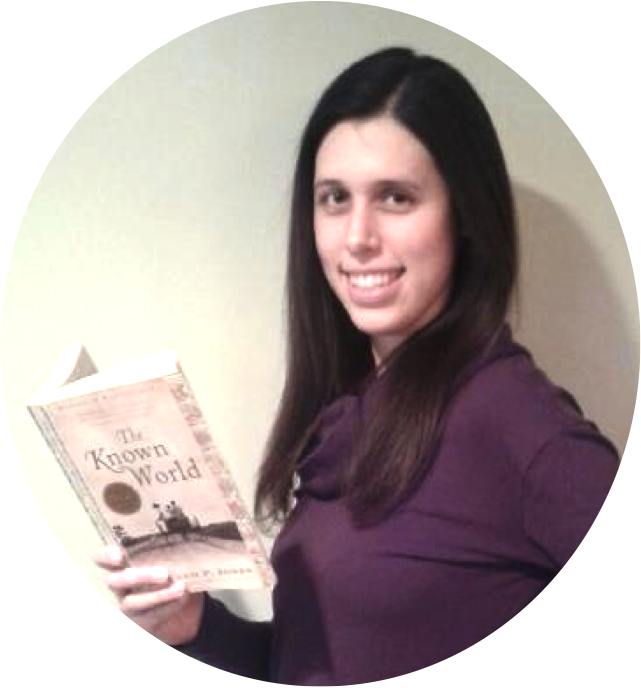 I encourage students to use as much language from the text as possible. From this brainstorming, an object that would serve as an appropriate symbol may arise. For example, in The Hunger Games, Peeta was a baker so a loaf of bread would be an obvious symbol to use for him. I’ve also used this activity with Of Mice and Men, and a red dress would be an obvious symbol for Curly’s wife. You may want to encourage students to think a little deeper and choose a symbol that is representative of the character’s traits. For example, in Of Mice and Men, Lennie is very curious, so a question mark might be used as a symbol for him or George is the more intelligent one in the pair, so a brain might be used as a symbol for him. Once students have selected an appropriate symbol, they will use the words that they brainstormed to create the image. I encourage students to do a rough draft first so they can play with the layout of the words. I find it easiest for them to lightly sketch out the lines of their drawing and then place the words on top. Some words may need to be larger or smaller than others. If needed, I allow students to repeat words. When students complete their final draft, I encourage them to use different colors for their words to help create the image. If they are going to color anything else, have them do light shading so that the words can all still be read. You'll be surprised with the creativity of your students and even "non-artistic" students will enjoy this activity. If you try it out with your students, I'd love to see what they come up with! You can find all of my Of Mice and Men resources, including the activity described above, here. 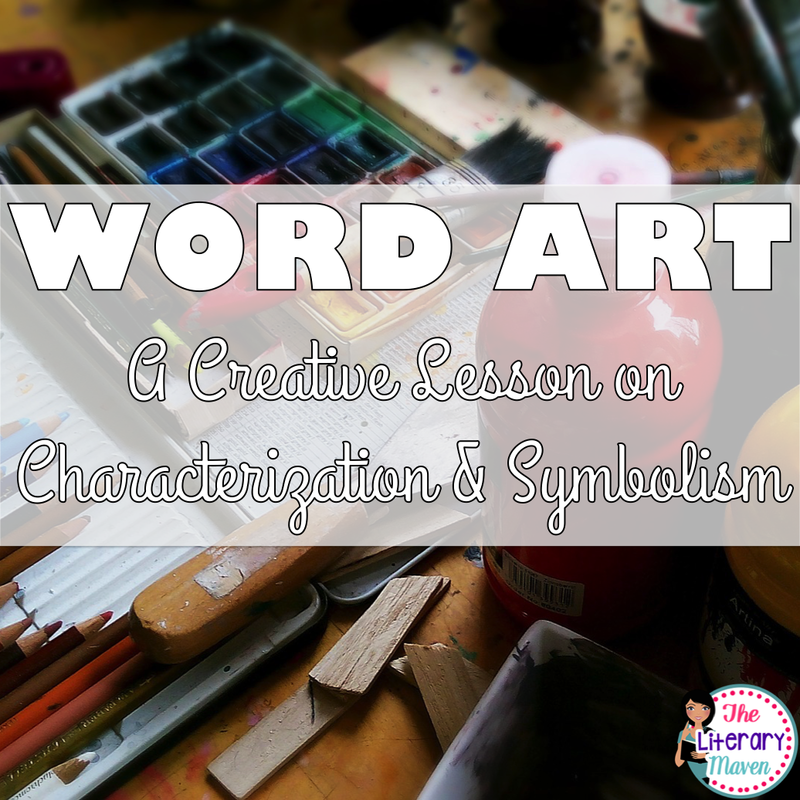 Oh my, I LOVE that symbolism project you had your students do. It looks like they produced some great work! I have not read Monster, but I am thinking I should, it looks like a great read and one to know. I have done that activity before with The Hunger Games and always love the results. Even students who are not artistic get so into it and they always choose symbols I never even considered. The best things about the activity is that it can be done with any text. Thanks for the shout out and the great idea to finish Of Mice and Men when we go back Monday...good refresher after a week off. I would love to know what texts you use for start time writing. You are welcome. Hoping you get lots of entries. You are reading Of Mice and Men too? Hope your students like the activity!